I'm a girl that loves to find specific colors in prints and match them perfectly to shirts, shoes, and handbags. But as I continue to fashion blog and evolve as a fashionista, I've been learning to match more and more with complimentary colors as well. Typical Blair would have matched this awesome Le Bomb Shop shirt to bright blue shoes...and it frankly would have been awesome. Haha. But lately I've been trying to use more colors, even if it's more of the same colors, to tie a whole outfit together. 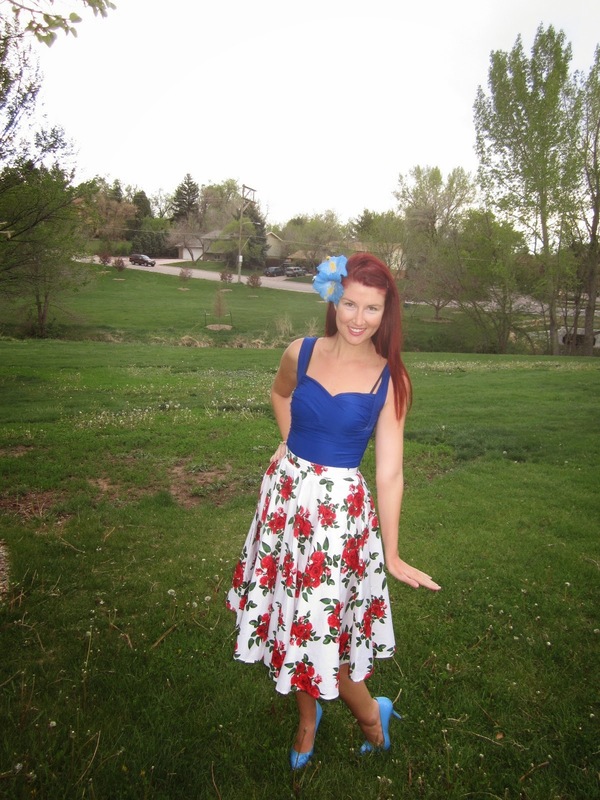 I decided to use this awesome Hell Bunny skirt I found via Unique Vintage as my palate and use a strong color to make the reds and greens pop, a la this cobalt blue pinup top. 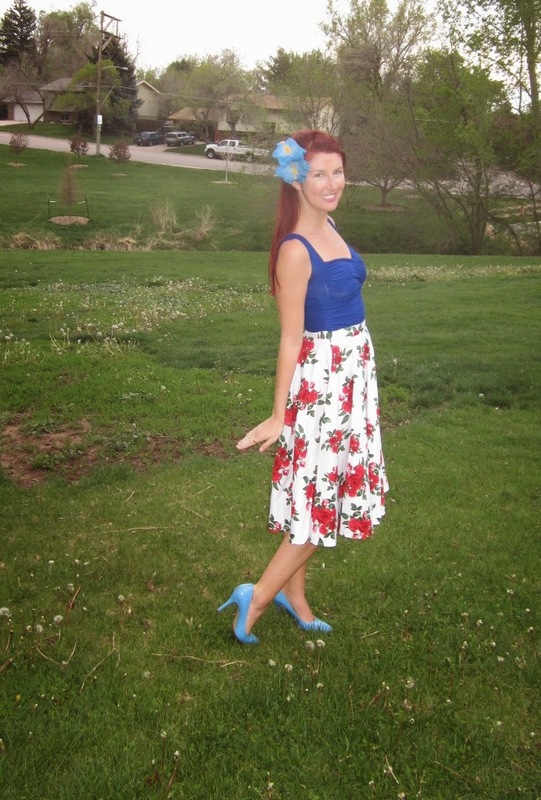 Instead of matching perfectly, I used my favorite shade of blue, powder or baby blue, to play off of the darker blue with my Sophisticated Lady Flowers hair flower and Nine West pumps. What do y'all think? Do you guys have any matching secrets? Is it better to match perfectly or find more creative ways to match? So pretty~~~ love that skirt and blue heels!! Neutrals are fun! Yeah, intuition is always best! 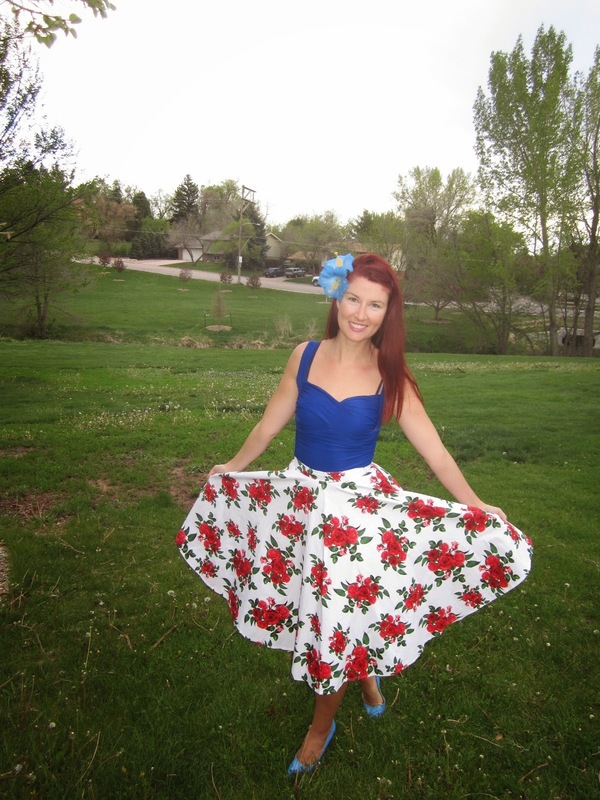 Love this bright, cheery skirt! Adore this skirt on you! The print is so fabulous. For matching, I usually go with the main item, say your skirt, and then pick one of the other colors in the skirt to compliment it. That or just go with whatever looks good haha! So beautiful and stylish outfit <3 Love your skirt so much!! You are radiating happiness in this post! 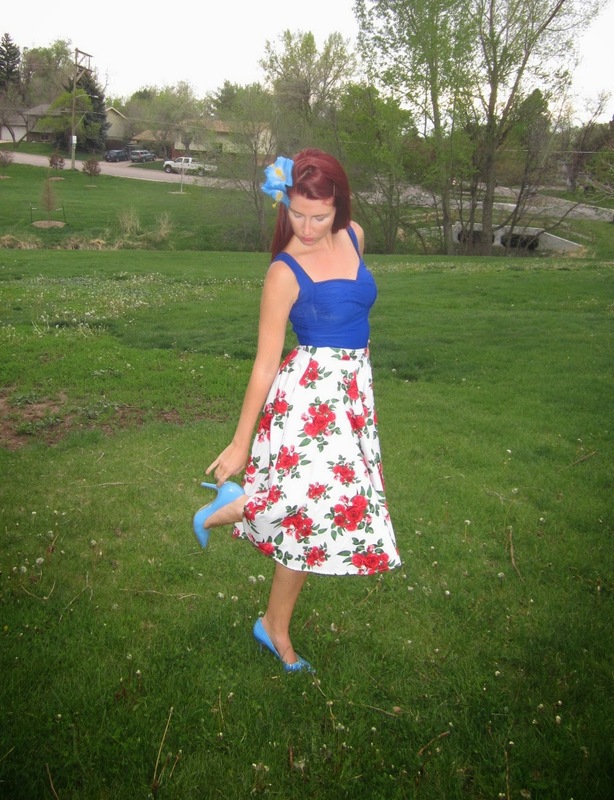 You have a great smile:) I really like how you paired these light blue pumps with this red, white and blue floral combo. It is so pretty! I can't believe Nine West makes so many pumps in different colors. That is good to know if I ever need a specific color shoe. Love this flower!